There are two common misconceptions about evolution. The first is that many people believe that Charles Darwin invented the idea of evolution. This is not true, for as far back as the ancient Greeks evolutionary ideas have abounded. Indeed, apart from a transcendent God, evolution appears to be the most likely explanation for the origin of the world. What Darwin did was to publish the elements of the modern theory of biological evolution, the descent with modification (variation) and survival of the fittest to select advantageous variations. The second misconception is that evolution applies only to biology. The first inroads of evolutionary thinking occurred in geology decades before the publication of Darwin's On the Origin of Species. This introduced the concept of uniformitarianism, demanding that vast ages were required to produce the geological formations we see today, which was a radical departure from the flood geology that had prevailed since the time of ancient Israel and before. This acceptance of deep time set the stage for the widespread acceptance of Darwin's writings. Darwin's work in turn opened the flood gates for evolutionism to permeate all areas of human endeavor, such as history, law, sociology, psychology, etc. Apart from the geological and biological sciences, modern astronomy has been greatly influenced by Darwin's evolutionary theory. The refusal to acknowledge God's existence and role in the universe has led to a reinterpretation of the origins of many astronomical features. For four decades, the dominant cosmological theory has been the Big Bang, the belief that the universe abruptly appeared 13.7 billion years ago in a very dense, hot state, and has been expanding ever since. Interestingly, some Christians see a need for the Creator to initiate the Big Bang, and hence use the Big Bang as an apologetic, but this ignores at least two important points. One is that the Big Bang does not conform to the Genesis account of creation, differing in many details such as the order of events. The other point is that cosmologists of late have developed ideas of how the universe could have come about on its own, such as a quantum fluctuation or as a part of a multiverse or the latest event in an eternal cyclic universe. As with any evolutionary theory, these are attempts to explain the world apart from a Creator. According to the Big Bang model, the universe began as a very hot gas consisting entirely of hydrogen and helium with just a small amount of lithium. As the universe expanded, it cooled and eventually stars and galaxies began to form. Astronomers are not sure how this commenced, but since we see huge numbers of stars and galaxies today, they reason that this must have happened. The most popular theory of galaxy formation is that the early universe had slightly more dense and less dense regions. The more dense regions had more gravity and thus acted as gravitational seeds to collect more gas. These massive, large gas clouds eventually contracted into the galaxies that we see today. Of course, scientists cannot actually observe this. Within galaxies, stars formed from clouds of gas. However, there is some debate today whether galaxies formed first and then subdivided into stars, or if stars formed first and then amalgamated into galaxies. While most matter in the universe still mostly consists of hydrogen and helium, a few percent of the universe's mass is in the heavier elements, such as the carbon, oxygen, nitrogen, calcium, and iron that we find in abundance on the earth and in the human body. Where did these heavier elements come from? Astronomers think that stars generally produce energy in their cores by the fusion of hydrogen into helium, and there is some evidence to support this theory. Using a very elaborate theory based upon our understanding of nuclear physics (in many ways a well-established theory), astronomers think that as stars age they often produce energy by fusing heavier elements up to and including iron. Astronomers think that massive stars end their existence in titanic explosions called supernovae. During a supernova, many of the elements heavier than iron are likely to be produced. Supernovae eruptions and other processes are supposed to introduce the products of nuclear fusion into space, where the newly synthesized elements mix with the hydrogen and helium already there. New generations of stars form from this gas and repeat the process. In this way, astronomers think that the heavier elements that we are so familiar with gradually build up in successively later generations of stars. Most astronomers believe that the solar system formed about 9 billion years after the Big Bang. A large gas cloud, now with a few percent of matter consisting of elements heavier than helium, collapsed, though it is not clear exactly what initiated that collapse. Most of the matter supposedly fell to the center to form the sun. The remaining small portion of the matter collapsed into a disk, from which the planets, satellites, asteroids, and comets eventually formed. The matter in the disk supposedly coalesced from microscopic bits into small bodies called planetesimals, though, again, how this process began is not clear. Once some planetesimals grew large enough, their gravity attracted other smaller planetesimals to themselves to form the bodies that we see in the solar system today. Astronomers generally think that the planetesimals that formed near the sun were heated by the early sun's radiation to evaporate the lighter elements from them. Planetesimals far from the sun were not heated much and thus retained many of the lighter elements. This is the evolutionary explanation for why the planets near the sun (the terrestrial planets) are so different from the planets far from the sun (the Jovian planets). Interestingly, in recent years astronomers have found hundreds of extra-solar planets orbiting other stars. All of these planets defy the evolutionary theory of how planets form, for extra-solar planets appear to be Jovian yet are very close to their parent stars, in contrast to what we see in the solar system. The post-Darwinian world of astronomy has seen the rise of numerous theories about origins. These include a series of "just so" stories about the naturalistic origin of the universe, of galaxies, of stars and other structures in the cosmos, the chemical evolution of the elements from hydrogen and helium, and the origin of the earth along with the rest of the solar system. 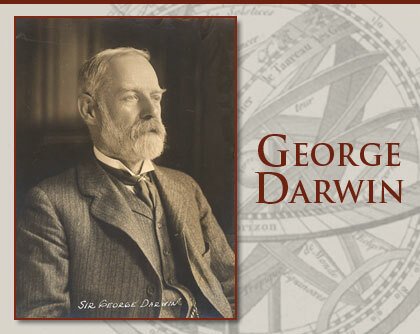 While Darwin did not address astronomy in his writings (though his son, George, was a noted astronomer of the latter 19th century), his legacy of excluding God lives on in the field of astronomy. Most of astronomy deals with the structure of the universe as it now exists, and creation scientists are fully engaged in these studies. However, the various attempts by astronomers to expel the Creator from the cosmos are simply untenable. It is only right to give credit for creation where it is due, even as the psalmist did in Psalm 8:3: "I consider thy heavens, the work of thy fingers, the moon and the stars, which thou hast ordained." George Darwin (1845-1912), the son of Charles Darwin, was a well-known astronomer and professor at the University of Cambridge. His specialty was the tidal interaction of the earth, sun, and moon, and in 1899 he published the definitive book on the subject, The Tides and Kindred Phenomena in the Solar System. In his work he noted that the moon is gradually spiraling away from the earth as the earth's rotation slows. This led George Darwin to propose the fission theory of the moon's origin. That is, the early earth spun so rapidly that a portion of the earth hurled outward to form the moon, which continued to spiral away. This scenario is fraught with problems and virtually no one believes it today, but it is recognized as perhaps the first of the modern theories of lunar origin. Interestingly, what we know of the mechanism driving the tidal interaction of the earth-moon system and the current rate of that interaction suggests that the earth-moon system can be no older than 1.3 billion years. Of course, this is far younger than the supposed 4.6-billion-year age of the earth-moon system, but it is not a problem for a 6,000-year-old creation. * Dr. Faulkner is Professor of Astronomy/Physics at the University of South Carolina Lancaster. Cite this article: Faulkner, D. 2009. The Big Bang, Multiverse, and Other Tales about Outer Space. Acts & Facts. 38 (2): 28.